It started its life as the ‘Alien Overlord’, has since been upgraded to the even more suiting title of ‘Alien Living Incubator’ and may just be one of the nicest alien monstrosity kits I’ve seen in years. 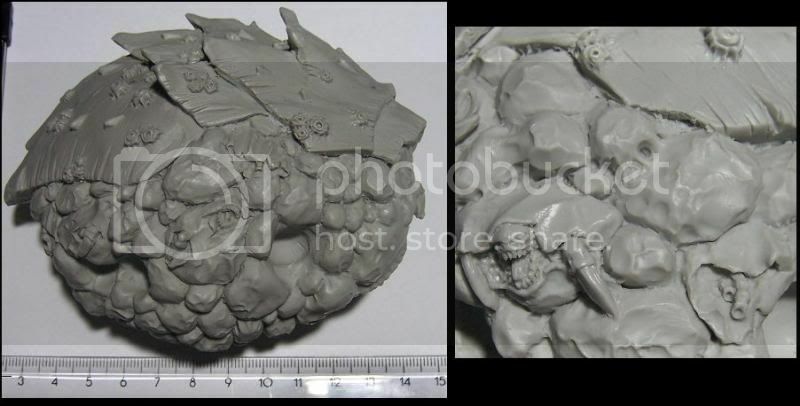 Produced by Puppets War (link) and on sale for 35 Euro, the Alien Living Incubator makes for an excellent stand-in for a Tyranid Tervigon. Heck, with some creative slicing, genesplitting and greenstuffing it could even form the basis for a mean Tyrannofex conversion. The cost of 35 Euro is also very reasonable for a kit of this size and detail, in fact just compare it to GW’s Carnifex of 39 Euro. It becomes even more interesting for players wanting to use the mini as a Tervigon, normally you’d need a Carnifex, a separate base and tons of conversion work =42,50 Euro and Hivemind knows how much time and trail-and-error. The Living Incubator, on the other hand, is a ready to go alternative! - Two identical front legs. - Four differently angled and modelled hind legs, which have been conveniently numbered on the bottom to help in the assembly process. - The rather sizable body, we’re talking tennis ball+ size here. - An oval-shaped, nicely textured base. As you can see in the pictures below, this is a pretty big and highly detailed model. Fully assembled the model is around 110mm in height and 95mm long, while the base is the exact same size as the base that comes with Games Workshop’s Trygon kit. 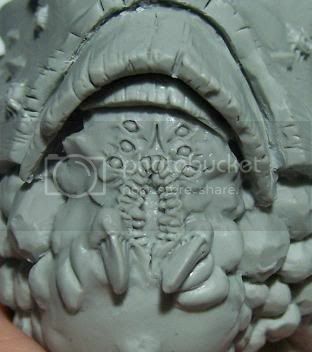 The model is highly detailed, with everything from the carapace plates to the individual egg sacs oozing with alien character. The latter in particular are very nice, there are a ton of them, some sacs have already been popped, while two of them are actually bursting open, revealing the horrific drones inside. The quality of the cast is very nice as well, in fact I only found a single air bubble on the entire model. And this one was even on the bottom of the body, so if I wasn’t such a detail freak I could have simply left it there. There are virtually no mold lines either, so after a quick clean and assembly it will be ready for paint in no time! 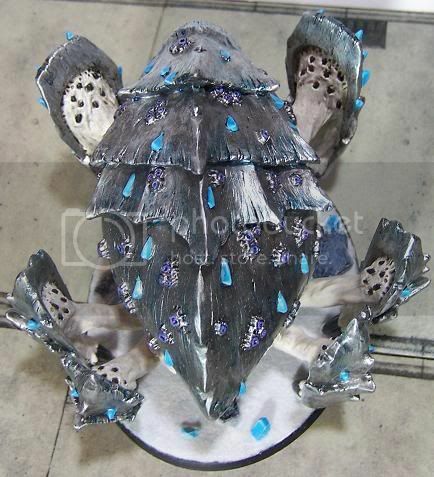 Designwise the Living Incubator mostly fits in fine with Tyranids, the texture and layeredness of the carapace really mirrors that of models like the Carnifex or Trygon. Luckily the model has enough character of its own to make it more than just a stand-in mini for a non-existent miniature for Warhammer 40.000 players. The Incubator’s head, in particular is something special. Throw together Starship Troopers’ brainbug and Mass Effect II’s Shadow Broker et voila, a face only a mother or Hivemind could love. Personally I bought the model to serve as a centerpiece for my Tyranids. Normally though I never seem to be able to leave a miniature alone, I always end up converting it somehow, someway. However, the combination of Tyranid-esque elements and the unique anatomy of the legs and face just made it feel ‘complete’ to me. That’s why I instantly started cleaning and painting it when it arrived on my doorstep, naturally making certain she’d have some offspring to guide into the fray! A. Pin the legs to make the bond between them and the body stronger. Though in all honesty the fit of the legs is solid enough to withstand most normal tabletop usage, however for those wanting to get a more dynamic pose or a more intense colourscheme on there it will definitely help to both add extra strength and keep pieces accessible until they are fully painted. B. Wash the parts before assembling and painting them. I did give one of the legs a quick test without this step and the paint adhered just fine. At the same time resin models often have a thin layer of mold release agent still left on them when they arrive at your doorstop, a substance that can make painting a pure hell. Just putting those resin bits into some mildly warm, soapy water and giving it a soft scrub isn’t going to take you a ton of extra time but in the case of resin it’s usually better to be safe than sorry. C. Inkt washes are your friend when painting this lovely gribbly, there is so much detail and fleshy texture on this mini that even relatively inexperienced painters will be able to get a stunning army centerpiece on the tabletop using just basic techniques. D. Finally you are working with resin here, so remember to be safe. So no filing down half the mini and subsequently sniffing the dust ;-) At the same time given that it is a resin mini, you could do a full remodel job on the legs. This might be an interesting option for those of you out there looking into getting multiple Living Incubators. The Alien Living Incubator is a pleasure to put together and paint up. 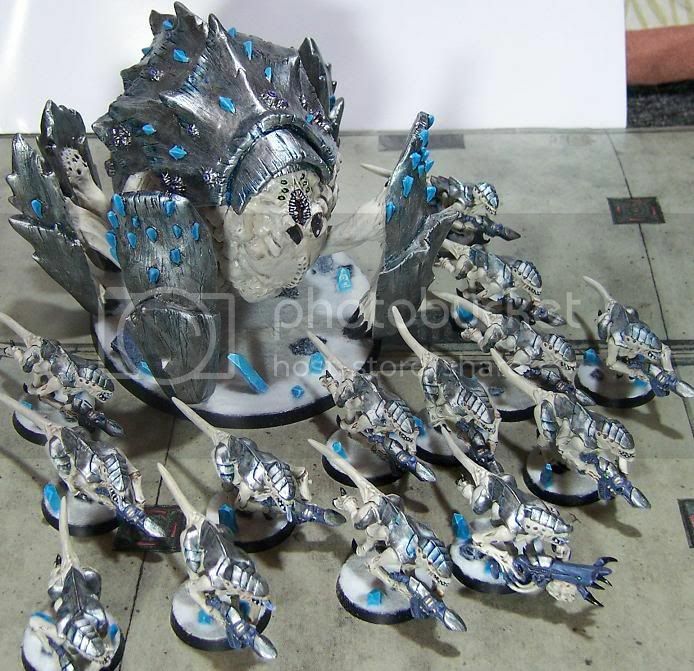 Its size and cost make it a perfect addition to any Tyranid player’s army and with the steady rise of other sci-fi games I am certain people will find other uses for this ‘miniature’ as well. All in all a great miniature at a very competitive price that is a ton of fun to work on! And that rounds up another product review, hope you enjoyed it and let me know if you end up getting one of these great minis. I’d love to see how a different colour scheme, leg configuration or conversion would look. Excellent! I just wrote a post early this week as a possible Tervigon, but I really just wanted to see one in person or with other Nids before I bought one. This is perfect! Thanks! My pleasure! As soon as the guys at Puppets War told me just how big this one was, I know I'd found my Tervigon. 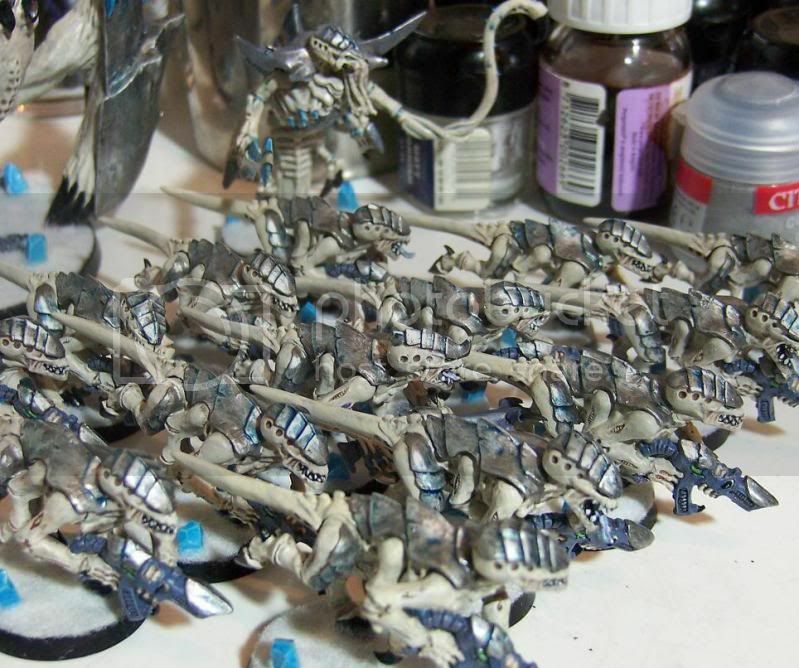 If definitely shares enough characteristics to make for a great army centerpiece!